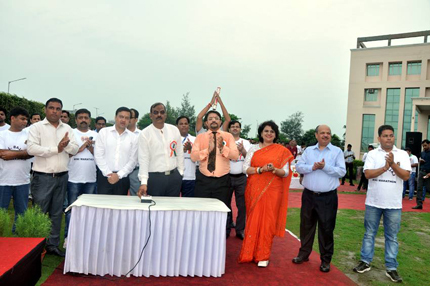 Independence Day was celebrated with all fun and fervor at GLBajaj Campus on 15th August,16. Honorable DM of Gautam Budh Nagar, Sh. N.P. Singh was the chief guest on the occasion. 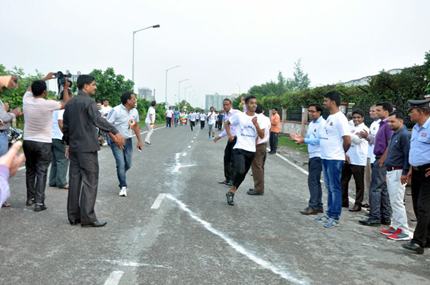 A mini- marathon with the cause of ‘Green and Clean Greater Noida’ was also organized on the day by the Dept. of Management. The program started with the welcome of Sh. N.P. Singh by Sh. Pankaj Agarwal (Vice- Chairman of the Group). Unfurling of national flag was done by Sh.N.P. Singh. 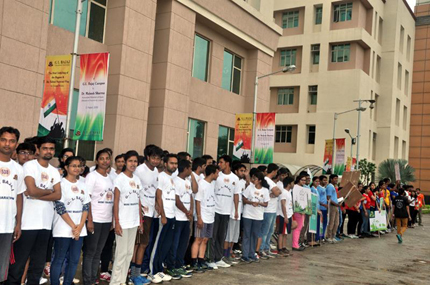 Then started the national anthem after which the whole campus echoed with the over joyed cries of ‘Bharat Mata ki jai’ and ‘Vande Matram’. In his address Sh. N.P. Singh said that we all work for our success but we never think on the lines of collective success. He said the collective success has to be kept in mind while taking any step as this can help to grow faster as a nation. 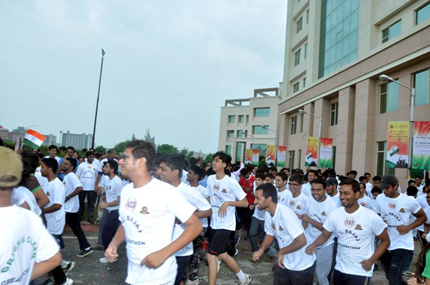 The gathering of around 600 students, faculty members and staff was equally excited about the mini marathon which stared just after the flag hoisting. As soon Sh. N.P. Singh signaled green, a gush of crowd started competing for winner positions. 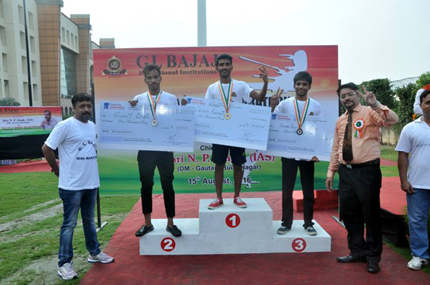 Beating all other students, Sachin Rawat (EC) won Gold, Sumit Bhati (CE), took away Silver and Aman Kumar Gautam (EC) earned Bronze medals respectively. Dr. N.K. 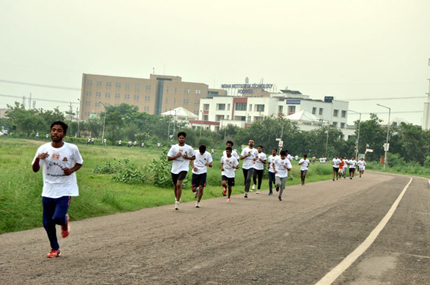 Sharma (Dean), and Dr. Mukul Gupta (Dean MBA) presented medals and gave cash prizes of Rs.10,000, Rs.5000, Rs.3000 to the first, second and third winners of the mini-marathon. They also congratulated Dr. Deepa Gupta (HOD, #MBA) and her team for the successful event.